The Lenovo Miix 510 is not just a simple tablet: it is a 2-in-1 with enough performance for work and play. With the detachable/attachable keyboard folio, it turns into a productivity machine very easily. In tablet mode it is your new favorite consumption device. How does it feel to use the Miix 510 and how does it work out in every day usage? Let’s find out! 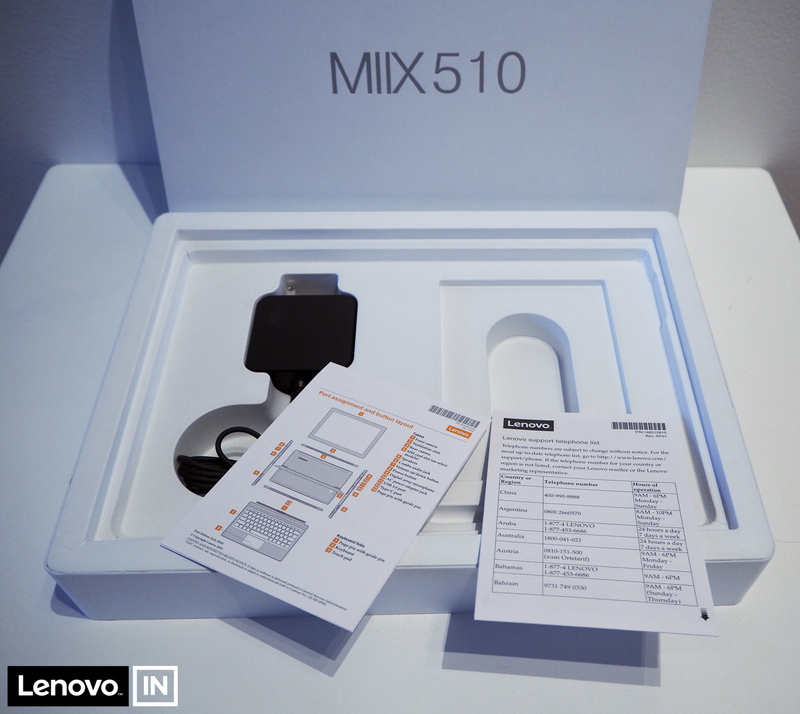 Disclaimer: The Miix 510 was sent to me as part of the Lenovo Insiders advocacy program. I did not receive any other compensation. All opinions presented in this article are my own. Tablets with keyboards have been around for a few years, and many companies tried to improve on this formulae. 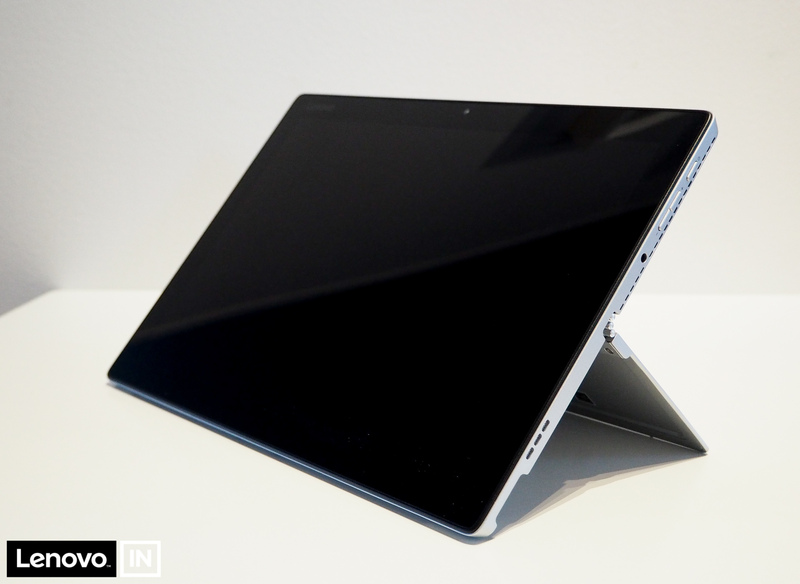 Without doubt Microsoft’s Surface line of products set a new standard in this category. But I see that manufacturers are not very keen to follow Microsoft’s lead. Lenovo announced the Miix 700 at IFA 2015, and the Miix line has been a low profile product line for Lenovo ever since. When I tried the Miix 700, I liked it right away. It was a great machine in a nice form factor. The Miix 510 is about the same form factor, but improves on the performance part (using a full blown mobile CPU instead of the “core m” family). It is fun and easy to use to browse the web or watch videos, and it even works great for work usage. I will be recommending this to friends and family who are looking for a computer, because I see it fits into the life of many people much better than a simple notebook would. 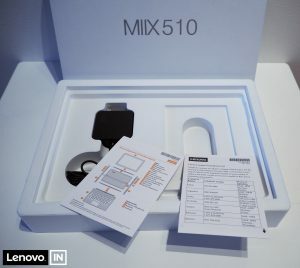 In this article I will be exploring the Miix 510 and provide more details about this neet little computer. I like the design of the tablet very much. The Miix 510 feels very nice in the hands, the aluminum body feels more like something from the premium class of devices than a mid-level consumer device. The device feels solid and build quality is great. It is nice to see Lenovo flowing top of the line model design elements to the middle-level computers as well. While CPU, RAM and storage options are a bit limited, this is because the Miix 510 is positioned as a mid level device, with the recently announced Miix 720 taking top spot in the Miix lineup. 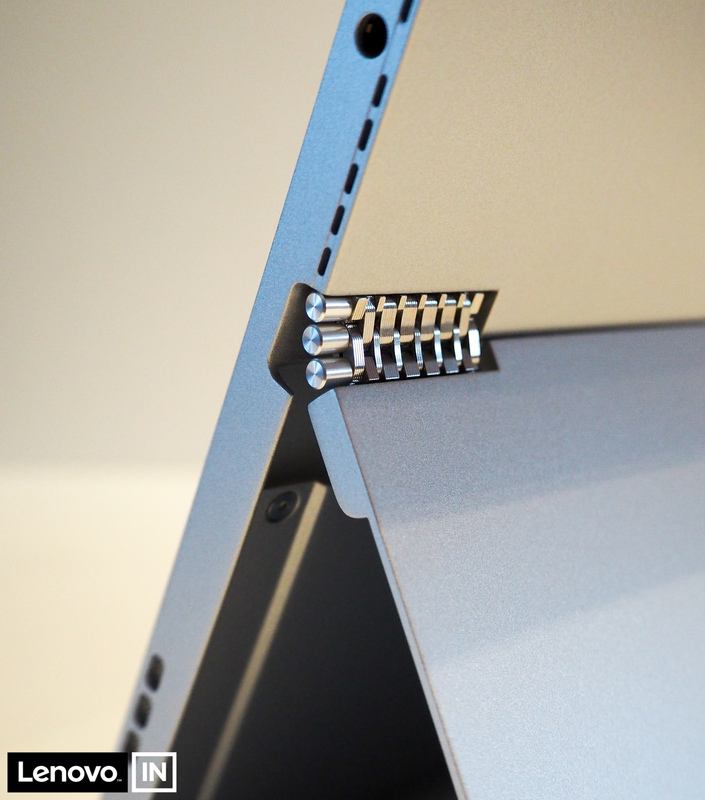 The Miix 510 features the watchband hinge that was first introduced in the Yoga line. 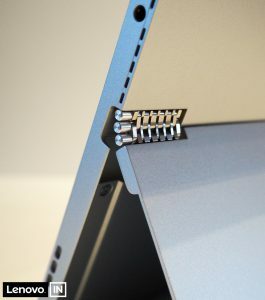 Both sides of the tablet have a small hinge. It keeps the stand firm and in place. It can open up to 150 degrees, which lets you set up a wide range of positions to work with the computer. 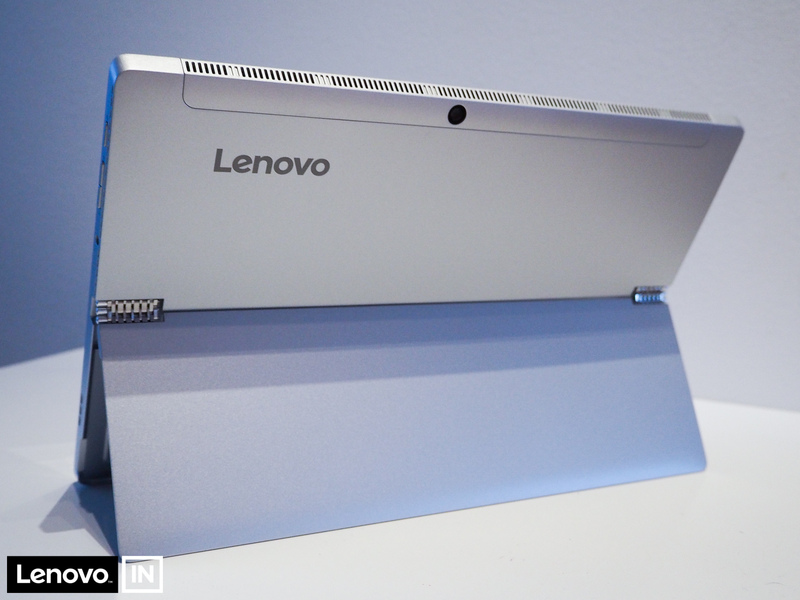 I especially like that the vents where the cooling fan blows out air is on the top and right hand side of the tablet. This way even when I am using it in bed, the hor air gets blown out into the air. Whenever I use a notebook in bed, on my lap, I have to worry the soft materials getting in the way of the air wents, because on notebooks they are contained on the chassis/keyboard part (usually on the bottom or the sides, which are first to be clogged up by bedsheets, etc). 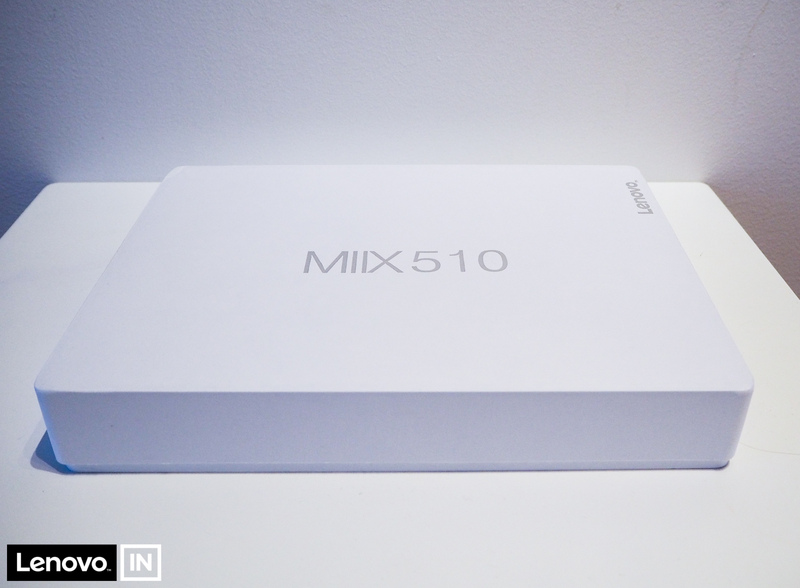 The Miix 510 came in a plain white box. It is not as sturdy and complex as the Yoga boxes, but a very nice box nevertheless. I like how Lenovo transitioned into having great design with their packaging as well. As you open the box, out comes the keyboard folio inside a nice carrying case. Underneath you will find the tablet itself, and then some papers (warranty and quick start) plus the power adaptor. On some markets the pen is included in the box. My model did not come with the pen in the box – read more about the pen later in this article. The notebook comes very clean, with no bloatware installed. Only a few Lenovo applications are installed in addition to the ones Windows comes with, but these I actually do not mind, and would have installed them myself anyway. Instead to offer all the software that you might want to install, Lenovo provides its own app, called the Lenovo App Explorer. I like this way of offering you software VERY VERY much. It allows people to install other apps easily, but they are not installed by default. 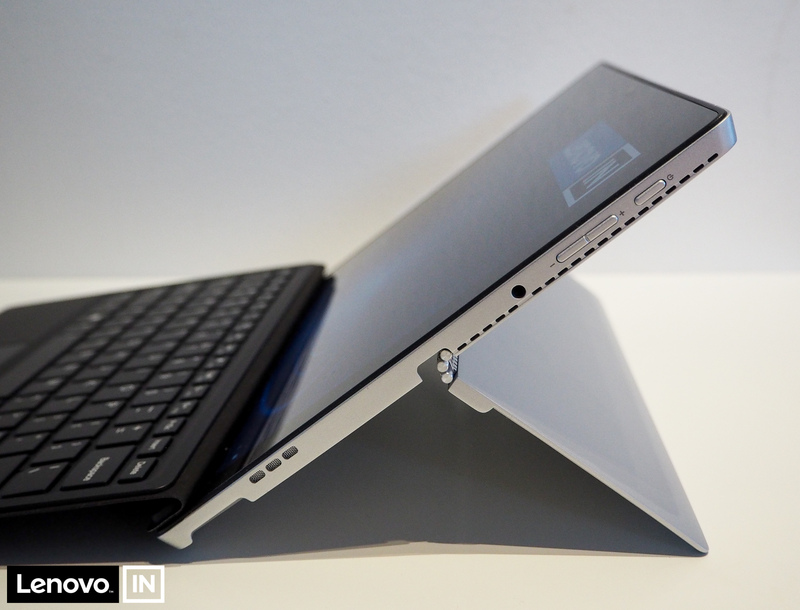 So is the 2-in-1 form factor good to use? I will have to create a separate article on the form factors of todays computers, because I find the usability story something I like to talk about separately from devices. What follows is just a short summary of thoughts. The Miix 510 is a tablet first and notebook second. But it does an excellent job at both. It is the first Windows tablet that I really really like and could use as my primary computer (do note that I have not tested ALL Windows tablets, just several. But my experience so far was far from good). In fact, during the review process I found that I use it more fondly for light tasks than my ThinkPad X1 Yoga! When I got the X1 Yoga, I was very happy with how nice it is for light usage as well, unlike my previous notebook. But now I find I have one more space in my life for yet another form factor and device. 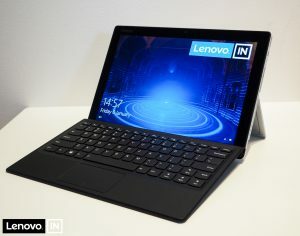 This is far from me saying that I would recommend everyone buy several devices (workstations, laptops, tablets) – rather that I was surprised how big a difference there actually is between a convertible notebook like the X1 Yoga and a 2-in-1 tablet, like the Miix 510. Something I did not expect. Before I began using them both my initial thought was that they would be quite close together. Does the Miix 510 work as a tablet? Usage as a tablet feels quite good. The Miix 510 is heavier than your average tablet, but then again it is also bigger and more powerful. It feels comfortable to hold in your hands (without the keyboard folio) for reading. The weight is about 880g (again, without the keyboard folio), which is a big on the heavy side in case you want to hold it for longer periods of time. It certainly is heavier than an iPad (I currently use an iPad Mini). For my personal usage, I might want to switch to something like the Miix as my tablet, and use it with the bigger iPhone, instead of my current smaller iPhone + iPad configuration. I do like the iPad a lot, but I also like how many things I can perform with the Miix that are difficult or borderline impossible to perform with the iPad. Your mileage will vary of course, because my digital and work life revolves around Microsoft’s developer technologies for now. Using the Miix 510 as a notebook feels very natural and comfortable. The keyboard is great – read more about it in it’s dedicated section below – and the performance is very nice as well. It runs any app, it has a strong CPU. Battery life exceeds my expectations. All in all, for people who need the occasional productivity tool but value mobility and consume content more than create it, this could be the ideal computer. The port selection is very minimal on the Miix 510. 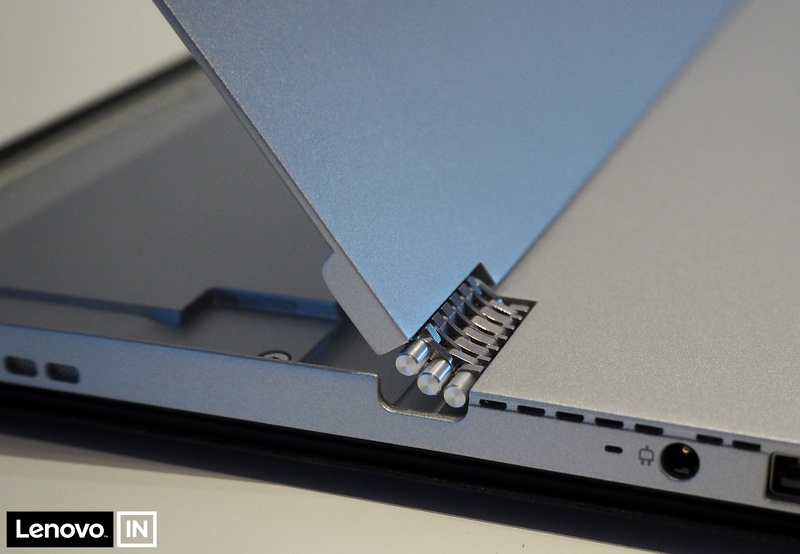 The Miix 510 cannot be powered through the Type-C port, you need a separate power adapter. Which of course leaves both USB ports free. The bottom side has the Pogo port where the keyboard folio attaches. The top side has air vents. 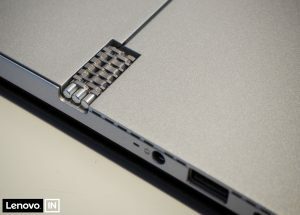 The Miix 510 has a USB Type-C connector that supports USB 3.0. This can be used as an USB 3.0 port, although you will probably need a dongle because natively Type-C devices are not in everyday use yet. It can be used as a display port pass through, which means the adapter in this case does not need to be big and bulky. You can also use it as a VGA output with the correct dongle. I tried the Miix 510 with a IOGEAR Type-C to HDMI adapter. https://www.iogear.com/product/GUC3CHD/. It works great and you can then use the Miix 510 with an external display or to run a presentation. Lenovo also sells their own dongle, although I was unable to get it in Finland. Because it has a single USB Type-C port and a single USB Type-A port, you will probably need adapters or hubs or a docking station if you want to use the Miix 510 on a desktop with lots of peripherals. When I first tried to connect the Miix 510 to an external display, I bumped into a strange issue: when I first connected the Miix to my regular display, there was no picture. The computer detected the display and the resolution, but nothing was displayed. I used both the display and the cable with other computers, so I was about to blame the IOGEAR adapter or the computer itself. But then I tried another HDMi cable, and it started working. Which is strange. So either the IOGEAR adapter has something to do with it, or the HDMI cable itself. Anyhow, now the setup is working and I can use the Miix 510 on an external display. The built in speakers lack bass, but they sound nice. If you listen to something other than music which require a lot of bass, they are adequate. You can watch your YouTube or Netflix videos, but if you want to listen to music or really enjoy your videos, I recommend headphones or external speakers. Also, concerning YouTube videos read the section about high def videos later in this review. The Miix 510 has a front facing 2Mp camera and a backfacing 5Mp camera. I tried video conferencing without external microphones and the built in cameras. Pictures was ok as was sound. The other party was audible and understandable, as was my own voice. The Miix 510 has a 16:10 IPS screen. The colors are vibrant and deep and the display is sharp. It has a 1920×1200 resolution. I liked the screen very much. The text is sharp and it is very easy to read anything. You might want to use display scaling set to 125% or 150%, as the screen is only 12″, and so at 100% the text might feel too small. Just for comparison, my X1 Yoga screen is also quite bright but it still needs 3-4 notches above minimum for me to be comfortable with it (30% – 40%). The Miix 510 also supports night mode. This is great news! I wrote a whole article about the night mode in the Miix 510! Night mode might be familiar if you use an iPhone or iPad recently, where at night it can shift the colors toward warmer tones, with less blue in them (Apple calls this night shift mode). Scientific research suggests, that looking at a screen late at night, with the regular color temperature of displays might interfere with sleep patterns. By eliminating the blue component, the screen is easier on the eyes in the dark and does not interfere with sleep (that much). 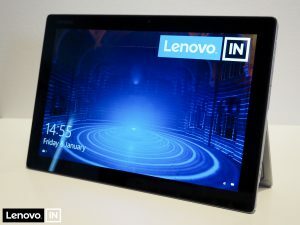 The Miix supports night mode through the Lenovo Settings Application. It can switched on manually or on a schedule. When switched on, the display takes on an orangish-reddish hue, but this is ideal for reading on the screen at night time. The Miix 510 comes with a FHD screen with a 1920×1200 resolution. So why would you run 4K videos on it? For one, 4K videos also look great on smaller screens. But I tested the 4K video performance to see how different browsers behave, because their video performance has been very different on other systems as well. I tested the three main browsers – Edge, Firefox and Chrome – and their video performance. Some of these browsers would use an excessive amount of CPU when used with high res videos. This problem is already familiar to me, and I have written about this problem several times: here and here. One of the main reasons is that YouTube wants to send your videos to you in VP9 codec for both Chrome and Firefox, by default. I find this VERY BAD practice from Google, since their codec is not hardware accelerated. This means that high performance video will eat a lot of CPU, meaning you will hear cooling fans fire up, your battery life will drop, and if you do anything else (in the background for example), your video will also start to drop frames. Use Microsoft Edge. It will default to x264 codec, that is hardware accelerated. Use Firefox but install the h264ify extension. Just to give you numbers, for a 4K video without the h264ify extension, Chrome uses 64-100% CPU. With this extension it uses about 6%. Edge uses around 4% and Firefox around 5-7% (with h264ify). My unit came with an Intel i5 6200U CPU. I was pleasantly surprised how fast and quick the system felt. Everyday tasks like web browsing, using Microsoft Office, doing emailing, Slacking, videos, everything works great. I then moved onto other things, and started coding. I used Visual Studio Code for a simple HTML5 game, and the development experience was very nice, no hickups whatsoever. So it was time to move into more robust things. I updated to Windows 10 Pro, crypted the entire storage with BitLocker, and then went on to install SQL Server and Visual Studio Enterprise to do some real work I would do with a computer everyday. And it still performed great. All in all, I was very pleasantly surprised how good performance got out of an i5 CPU that was not the fastest option out there. I can certainly recommend it for almost anyone (if you require vPro, then you need to look elsewhere, the Miix 510 does not come with a CPU that has vPro support). The keyboard folio might look like a flimsy thing in the pictures, but it is actually a very comfortable keyboard. And it has backlight too! The backlight can be turned on or off, it does not offer automatic or dimmed setting. They keys have decent travel for such a flat keyboard. I think the keys are very comfortable to type on. If I need to place it on the scale of Lenovo keyboards, I would risk saying the keys felt better than the YOGA notebook keyboards (when used on a flat surface such as a table). It is not quite a ThinkPad keyboard, but it feels surprisingly solid to use. It required a little bit of time to get used to – less than the average time I need per computer to get up to speed in typing. 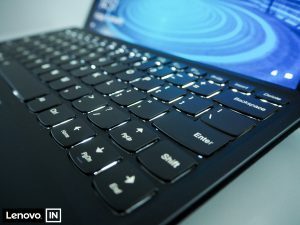 If you use the keyboard folio at an angle – when it is attached to the bottom bezel of the screen – it wobbles a little, but it is barely noticeable with normal use, and I was not bothered by it. I would say it is very very close to the typing experience on a real notebook keyboard. If you lay it flat on the desk, it doesn’t feel wobbly at all. In this case the keys are not at an angle, but the keys are solid and typing feels really great. For using it in the lap when your legs are not straight, it becomes a little uncomfortable, because the stand needs some place, and your thighs will probably not be long enough. Compared to a laptop it needs more space on your legs because of the stand. This makes the Miix a slightly worse option on your lap than a laptop. If you prop up your legs or use it in the bed, when legs are not ending with the knees, I found the Miix comfortable to use. However I did find some problems when the keyboard is not against a solid surface, such as when using on top of bedsheet. In bed if I tried to rest my wrists on the wrist rest areas, the folio keybaord started bending a little, and sometimes this resulted in the enter key being detected when I was not pressing anything. So the in bed usage is not so good if you want to type a lot of things. Or just get something solid – like a tray. All in all I am pretty satisfied with the usability of the Miix 510. One small note concerning the keyboard. The awkward placement of the right shift key is a little bit hard to get used to. But this could be the problem with any keyboard, because it has more to do with the layout than the feel of the keyboard. Also, I tested the Miix 510 with a US keyboard, and normally I use nordic keyboards. The Miix 510 detects if the keyboard folio is attached, and if it is closed. When the folio is attached and closed, the power button does not react, and does not turn the computer on. This can be a problem if you want to use the Miix 510 “docked”. Although I have a USB hub and external display connected, it will not turn off, unless you open the keyboard folio. And as soon as you close it, the computer sleeps. In the Windows Power Settings, you have to turn off the setting for the computer to close when the lid is closed. If you turn this off, you can close the keyboard folio and the Miix will not sleep. I turned this off for when the computer is plugged it, and this way I was able to use it comfortably. Of course you can just leave the Miix screen open and use it as a second screen! Using touch is a lot faster for certain operations than doing the same things with the mouse. Windows is also becoming better and better with touch support, and I would probably want all my devices supporting touch going forward. The touch input on the Miix 510 is very quick to react and fluid to show results. Animations are smooth and the tablet is a joy to use. In addition to touch, the Miix 510 also supports pen input. The tablet contains a Wacom active digitizer, which supports 2048 pressure levels, which should make any artist happy. Before purchasing a Miix 510, check that your version comes with the pen, because in Finland getting a separate pen turned out to be a pain point. Some other Lenovo pens might work. I tested the Miix 510 with the stylus from my X1 Yoga, and it worked great. The screen can be used with capacitive stylus as well, but this is very similar to using your finger. Pressure is not detected when used with a capacitive stylus. I have not performed any scientific battery life tests. I leave that to other pages. Instead, as is my custom, I test it using my own usage patterns and real life scenarios. With lights usage (web browsing, writing emails or documents, listening to offline music) I can get around 8 hours out of the Miix 510. If I really concentrate on just writing things, even 9 hours is possible. If I add in videos or online music services this starts to drop to about 6 hours. Using something power hungry this will get even lower. Looking at my usage stats in Windows I get about 7 hours on average. But I do tend to use the Miix for lighter things, and less for development for example. But it still means that the Miix is something that hits my sweet spot in battery life usability: it lasts long when I need it, and it powerful enough for any task when I need that! Note that I used the screen mostly on brightness level 1 – that is 10%. At night, in the dark, I would even go into settings to make that 5% or 7%. Other levels felt unnecesarily bright. But this does not mean that the screen would be actually dark – as I wrote above, even on these low levels the brightness compares to much brighter levels on my regular notebook. I wanted to mention this, because I suspect that other sites might test with a higher brightness level. And I have found that the biggest battery hog today in almost every notebook and computer is the screen brightness! The Miix 510 is a fantastic little device that I like really much. During this few weeks I have been using it I found myself using it a lot. I typed this review on it, exclusively. I coded using it. And sometimes I just read on it with the backlight dimmed and night mode enabled. It proved itself to be really versatile with adapting for whatever I was doing. 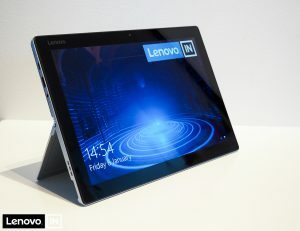 Lenovo’s catchphrase is “for work and play”, and it captures the spirit of the Miix 510 perfectly. I will definately keep using it and report back on how it did after a more extended use. I can use for work, for leisure. The Miix 510 is very portable, you could use it both for consumption of content (without the keyboard) or for productivity. If you write a lot, if you study or if you draw, this is a fantastic little device to have. I highly recommend checking out the Miix 510 if you are looking for a new computer for home, either for leisure, work or study. The Miix 510 certainly looks well enough and professional enough to be used in a work environment. 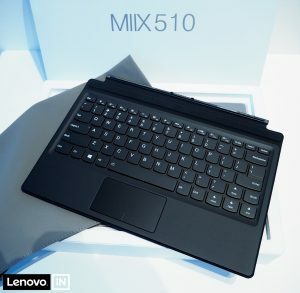 If you are a student, you work with Office applications, or you just want a computer for home to hang out with, the Miix 510 can be your perfect companion. If you require lots of CPU or GPU power, or you are in a corporate environment where you need vPro, you might want to look at full blown notebooks instead (or check out the Miix 720). Note that the Miix 510 has a TPM 2.0 compatible system, so you can run BitLocker and encrypt your entire hard drive. If you are a developer, you might want to check the size of the screen before purchasing. I feel comfortable on a screen this size as well, but complicated IDEs might feel too small for your taste on a 12″ screen. Because the screen has FHD resolution, you will probably need little or no scaling, so IDEs that do not work on high resolution displays should also work on the Miix 510 (Eclipse and Netbeans, looking at you and your teeny tiny icons). If you are graphical artist or designer, the Wacom digitizer and pen could mean you can use the Miix 510 for your work. It is hard for me to judge this aspect, because my workflow is so different, but I would think the Miix 510 is good for this kind of creative work. If however you require more intensive applications, video editing or 3D rendering, the Miix 510 might not be powerful enough for you. If you like to attach lots of other devices to your computer, know that you will probably need a USB hub to have everything connected. I just bought this MIIX 510 in Hong Kong, and the keyboard does NOT have backlight. I wish to return it. The Miix 510 keyboard is available both with and without a backlight. Ask your retailer if he has a model with the backlit keyboard! I have a couple of questions: 1. Can the keyboard be used unattached? IE, does it have bluetooth capability built in? 2. Do you know if it supports Java? I assume it does since it’s running on Windows 10, but I need to be certain before buying. I’m researching for use in a retail business with a POS system that is powered by Java so this is crucial. No, the keyboard does not work when disconnected. It is not bluetooth, neither does it have a battery built in. The keyboard is powered by the tablet itself. In case you need the keyboard to be further away, just get a separate bluetooth keyboard. You can install Java and run Java apps on it, no problem. This tablet is much like a “regular” notebook, you can run the same apps as everywhere else. I can say it is a great and versatile machine that I use a lot! Thank you for the great review. I would like to check with you on which SSD capacity size are you using? I’m looking at 256GB for MIIX510 (i5) for programming work and studies (I’m a full time developer and part-time student). Is 256GB enough? I am using Google Drive as well for studies (lecture slides etc). I’m only worried for Visual Studio which usually takes up a lot of space (unless I choose the smaller version and not the full package). I have 512GB version of the Miix 510. I have lots of things installed, including Visual Studio, and I have not filled it up at all, not even half. Of course it is currently not my main machine, so it is hard to compare. I can compare space usage to my main development machine. I just did a clean install on this one, and installed lots of features from Visual Studio 2017 on a partition that is about 220GB in size, with free space left. So unless you start doing other things with your machine, like video editing, photos or gaming – that take up a lot of space – you should be fine for developing with the 256Gb version. Do you find the fan noise loud (comparing to laptops) when using MIIX 510 for development work? If your program actually does something heavy, the CPU fan will kick in, but I am not bothered by it. It is a swooshing noise, and not very loud in my opinion. I got that one, and the fan noise is one of the most annoying I have ever heard. It is much louder than the surface pro and starts spinning at pretty high speed, while not producing any airflow at all. also since some update, it will start spinning at around 42°C, no matter how many settings you change. 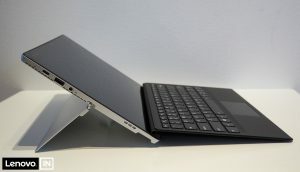 I’m considering to buy myself an used Miix 510 with a German keyboard. I live in Finland as well and was curious if I could buy a nordic folio keyboard for it, or if I should just buy some keyboard stickers. Searching Lenovo’s spare parts store, they don’t really seem to list anything for the miix series. Unlike other 2-in-1 laptops, apparently the Miix series is easy to take apart and fix it yourself – which makes it even stranger that I couldn’t find any spare parts for sale. Would love to have the option to replace the battery and/or ssd later on if needed. Thanks for the review, it was a good read! I also facing the same HDMI issue and my monitor unable to detect my Miix 510. I can confirmed my monitor, adapter and HDMI have no issue on other PC or notebook. I believed this is plug and play and I have also adjusted my resolution to fix my monitor but unable to resolve the issue. May I know whether your “another HDMI” cable is shorter in length or any other differences? All my HDMI cables are around 150cm. It might be that the cables are for different versions of the HDMI standard, but I have little knowledge of how to tell if they are different in this way? does it support external HDD? The Miix 510 has one USB Type-A port, where you can connect an external HDD. I don’t know if the Type-C port accepts external disks or not. I am 3D Designing Engineer (Small Houses) & project Manager. is Miix good for me? Do you require the use of CAD software? If the answer to that is yes, running that on the Miix may or may not be ideal. The Miix only has an integrated graphics chip, and CAD software is often very graphics intensive. I have no experience with CAD software, but is something to consider. Also, the screen is quite small for designing houses, so unless you plan to hook up an external display, this might also restrict your work. For project management I would think the Miix 510 would work great. Performance wise I think it should work, especially if you get a i5 or i7 version. Hello, thanks for your review! I’m a Uni student and wanted something that would allow me to annotate on PDF and Microsoft office files. I was wondering if that would be possible with the miix 510. Thanks! It certainly is possible! But if you want the pen, check if your selected configuration contains the pen, otherwise you need to purchase it separately! The pen is not included in every configuration of the Miix 510 automatically! Office supports ink annotations in Word, Excel, PowerPoint and of course OneNote to take notes. Thank you so much for your input and tips. Gonna purchase the Miix 510 right now! I’m glad I found this review and more than a little encouraged by the fact that you’ve used this machine for development work. I’m a Mac user and developer but am now looking for a Windows machine to use for Windows-based IoT and Bot development work – with Visual Studio Community Edition, the IoT Core and other Azure tools. Whilst I could install these under a Windows 10 VM or image installed with Bootcamp on my MacBook Air, I wouldn’t have enough disk space left to combine this and my Mac development needs. The big question: although you’ve covered it in the article, do you think that this machine has enough power and disk space to serve as a development machine for moderate Azure-based IoT (on Raspberry Pi) and other Visual Studio dev tasks? I’d really appreciate your feedback as I have my eye on a nearly-new one of these and now very tempted thanks to your article! Thanks for the quick response Lenard. The model I found has 8GB RAM and a 256GB SSD but I’m not expecting to be working with large amounts of files or very large projects so I’m assuming that’ll be enough – with an external drive to tidy up old project files onto 😉 Exciting stuff! Hello, the only thing i am having trouble with my MiiX510, is when typing text (word doc) the cursor will constantly reposition itself to another part of the screen, all the time, every time.